Feed the senses with exotic foods and drinks this season. Tabytha Towe “The extraordinary cocktail artist”, who went to Toronto from her home town Vancouver a few years back, is a mainstay at the Drake Hotel, where she mixes up great ideas for celebrities, hotel guest and some of the city’s best-known Bartenders who make the Drake their home away from home. Tabytha will be sharing with us some seasonal drinks ideas to serve at your parties this season. If you are in Toronto (Canada) do stop by the Drake Hotel and ask for Tabytha to mix you one of her specials. Tinamarie Bernard, is going to tell us what foods and settings will bring out your true sensual side this Season. 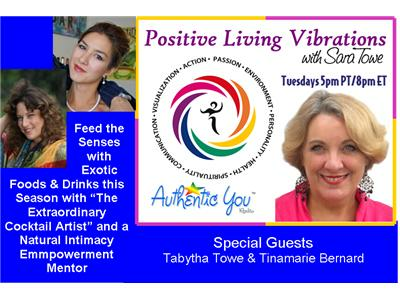 Tinamarie Bernard is a natural intimacy empowerment mentor who helps women transforms sexual wounds into wellness. Her mission is to inspire others to go from burnt-out to bodacious by embracing a naturally healthy and intuitive lifestyle! A frequent radio guest, sought-after speaker and coach, Tinamarie has written hundreds of articles and helped thousand transform intimacies, inspired by nature. Provocative, sensitive and transparent, she candidly explores the connections between vitality, sexuality and love.